There’s a good chance. We’ve had a lot of different looks on that line and nothing seemed to really stick with us to this point. We’ve played Kempe in the middle, on the wing, we’ve played Cammy left wing, right wing, we’ve had Auger up for practice, Dowder’s been in and out of there, and Brodzinski, everybody’s had a turn at some point on that line, so we’re just hoping there’s something that develops a little chemistry, gives us a little more continuity. It can maybe take some more minutes for us, create a little more. We’re not quite sure what that is yet, but we’re hoping that something works. [Reporter: What’s missing from Cammy’s game that he had to sit for two?] We’re just looking – sometimes it’s not the guy you take out. You’re looking at somebody you’re putting in. We know Cammy, he’s a quality, veteran guy that keeps himself in great shape, and he’s a really opportunistic scorer, so we just wanted to see a little more time in the offensive zone, maybe a little more execution in the first two zones to get there, and then create a little more just by his tenacity, coming up with loose pucks, getting in the right areas. It’s not as much about trying to find the right mix on that line than it was about taking somebody out. With Pierre, we added a guy that’s got great personality, great energy. Played the game at a really high level, so I think if you look at our staff, we’ve tried to cover a lot of ground with different personalities, and we’ve added a guy that can give us a vision offensively, a guy that played the game at a very high level, and maybe look at some key situations and give some insight that we might otherwise not have had. We think he’s been a valuable addition to our team. We’ve got him involved with some things like tracking scoring chances, paying attention to faceoffs – not just the centermen, but the movement off the faceoff – so we’ve really kind of given him the perspective of just focus on the offensive side of the puck, give us some perspective in terms of the structure, how we want to play, and certainly add his expertise that only he can provide because of the level of player that he was. [Reporter: Will he be in your ear or any of the assistants during the game, or is it just more?] I don’t like anybody in my ear during the game. Billy Ranford’s on the headset, Donnie Nachbaur on the bench, and then our video guys in the back, they have the ability to review plays. I mean, our guys start looking at off-sides as soon as the thing’s close. When a play’s going on, Billy will do it. Anything they see see structurally, pass on information that they can see from above. Maybe they saw something off a faceoff, something certainly as it applies to special teams, so there’s lots of communication, and that would be relayed to me at some point. But I’ve never liked to be attached to the walkie talkie and talking to anybody but people that are with me. Probably the easiest way I could sum it up is we want to give them freedom of discipline. Give respect and discipline to the way we want to play in terms of structure, but we still want to give them the freedom to use their skill and be good players. It’s been a deal they’ve embraced. We want them to really attack and try to score, but we use the term when we don’t have the puck ‘we should all look the same.’ Whether you’re Kopitar or Clifford, Doughty or Folin, if you don’t have the puck, we should all look the same and we should have the same commitment to getting back. When we do have the puck, there’s a way we want to play, but we’re all capable of different things. That’s kind of the deal we’ve put in front of the players from Day 1 and I think they’ve embraced it and done a good job with it. To be honest with you, it’s not a whole lot different in terms of preparation and dealing with the team. When I was coaching in Philly I really relied on my staff. When I was here with Darryl and previously with Terry, we had a lot of responsibility in terms of preparation and working with the players. The biggest difference is just you have to carry the message. I think as an assistant coach, you make sure you support the message and do everything you can to prepare your team. Now, that part’s the same, the input on the message, but the final message comes from you. So that’s a little bit different. Spending time talking to the media is probably another big change, but it’s been good. I’ve been very fortunate that I’ve come into a situation where I’ve been here for seven years and got a really good relationship with the players and the people here, so I think the transition has been much easier. We looked at our team over the summer, and Brownie’s one guy actually coming out of the last year where we thought his game was trending in the right direction. If you look at what he did last year, he was actually starting to come a little bit. But I think this year he came in and he really wanted to get back to being the power forward that he knew he was when he had a lot of success. He plays a real north-south game, he’s been pursuing the puck as good as anybody on our team, he’s got a real physical element to his game that ends up getting a lot of loose pucks, but his whole focus is on being at the net, getting to the net, what he’s doing around the net – whether it’s screening the goalie or coming up with loose pucks – and it’s not only helped his game, it’s helped the people he’s played with. If you look back when he was a great player putting 30 goals in, that’s where he was all the time. That’s where he was always trying to get to, and I think that reference point for him has really resonated with what he needs to do to be a good player, and he looks like his old self and it’s great to see. Maybe not as many greasy goals as we’d like. I think we’ve been around the net more. I think our net presence has become a real focal point for our hockey team. I think our rush play has improved. I do like the progress we’re making in terms of our structure in the offensive zone, but certainly being at the net. 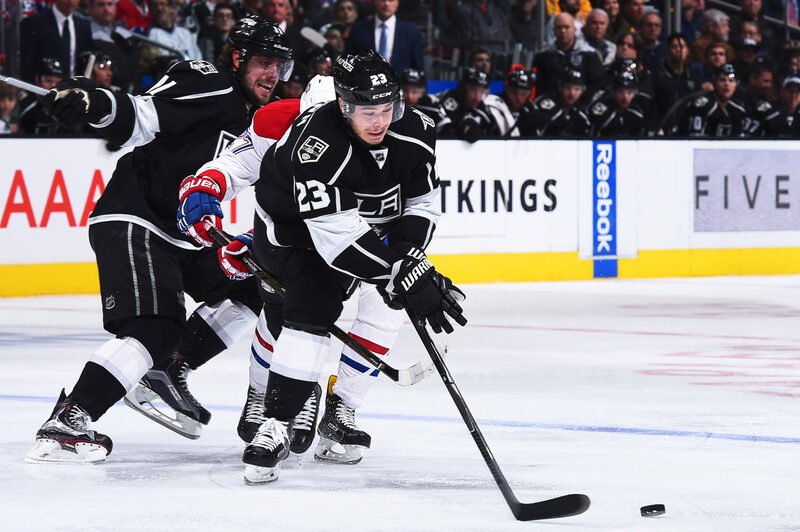 Tanner Pearson and Dustin Brown are two guys that have really embraced that idea – the whole idea of getting to the net, having somebody at the net, going to the net, being there, what it means being there – as a pillar of what we want to do offensively, both on the rush and in the zone. It’s something the guys are really starting to grab a hold on to. I don’t think we’re there yet by any means, but we certainly see signs that it’s coming. Well, we’re certainly not taking that approach in our daily preparation. We look at the season in five-game segments. We just finished our first five, and now we’re starting our second five. We’ve got one game at home and then a big road trip coming up, so we’ve got a lot of work to do. Even though our record is good off the start, I think we’d all agree there’s lots of things we need to improve on, so we’ve got lots of work to do and we’ve got lots of areas to get better at, and I think our guys know that. We certainly know that, and we’re taking steps to try and make sure that happens. [Reporter: The five-game segments, is that throughout the season?] We do it up to game 80. We’re hoping 81 and 82 don’t matter. We do 16 five-game segments. There are different things we track, and we keep it posted. We let the players know what it is, and we review it when it’s done. There are things we think are important to winning, and those are things we’ll track as a group and then monitor as we move through the season. [Reporter: Like, you can be in the middle of a road trip, and it doesn’t matter. It’s five games. Is that a universal NHL thing, or is that something that you focus on?] No, I think everybody does something along those lines. Some teams have done seven games. We’ve done five games. It works well for us. We looked at seven-games this year, but there are just some things that are important to keep an eye on where we rank in the league in those categories because we think they’re important, and I think history tells you they’re important. So it just kind of helps narrow the focus, it helps you worry about today and not get too far ahead of yourselves. Sometimes you can play a good game and lose, and statistically you can just say, ‘stay with it, you’re going to play well,’ and then sometimes you’re winning hockey games that that stuff tells you you better sharpen up a little bit or you’re going to start losing hockey games. It’s just something we’ve always done. I think it helps keep a long season in perspective in little chunks where it’s easier to manage and stay on task. [Reporter: Did you do that in Philadelphia, too?] Yeah. [Reporter: It used to be seven games here, the last couple years?] No, we’ve always done five. [Reporter: Is it as simple as trying to get seven out of 10 points, or is it deeper than that?] Well, that’s certainly a part of it. Points are the most important thing, that’s why we play. If you don’t get seven points a segment, you’re probably going to be eight-and-10 in the standings. If you get seven-to-10, you’re probably in the top three in your division, at least that’s what history tells us. It’s a good barometer. If you just try to get 95 points and don’t have a plan on how to get there, it’s like trying to retire in 20 years but not putting any money away now. It’s probably not going to work in the end. -One omitted quote can be found in today’s morning skate notes.